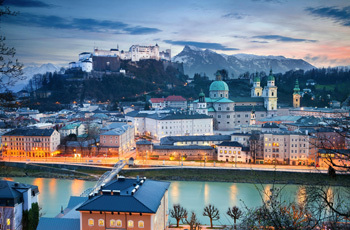 Delight in the stunning beauty of picturesque Salzburg, then enjoy a week in cosmopolitan Vienna! One week each in personally selected apartments in the Salzburg area and Vienna. Salzburg: A 2nd class 5-day rail pass, good throughout Austria, plus local transportation tickets. Transport between destinations: Travel by rail to Vienna using rail pass, with transfer assistance on either end. Local info and Untouring Austria and Untouring Vienna guidebooks, both researched and written by Untours staff, full of insider tips and sightseeing suggestions. An Untours sponsored event, usually a dinner with our local staff person.